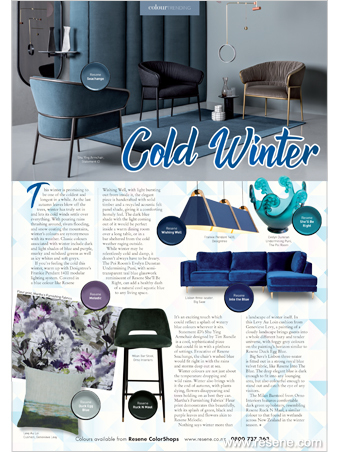 We get used to seeing fashion trends come and go with the seasons – its fitted jeans this year, and loose the next – but with our homes, the process of change and fashion is a gentler transition. Trends often reflect the times in which we live. When the world seems a mad, bad place or we feel sensory overload from our busy bright lives, we seek safe, nurturing spaces at home. Or if the world seems an exciting smorgasbord of new places to discover, we bring home the colours and flavours of our travels. Seek sanctuary with hushed tones. 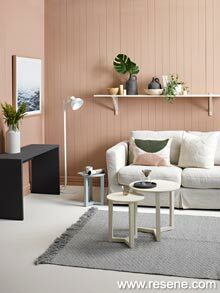 Soft and simple, these sanctuary colours are a hushed environment to retreat to and embark on mindful living. They create a safe environment to retreat to, so we can recharge our emotional and physical batteries after being constantly bombarded by technology, social media and fast-paced graphics. 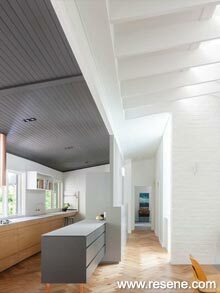 This is the Scandi look of recent years, but in a slightly stronger way. 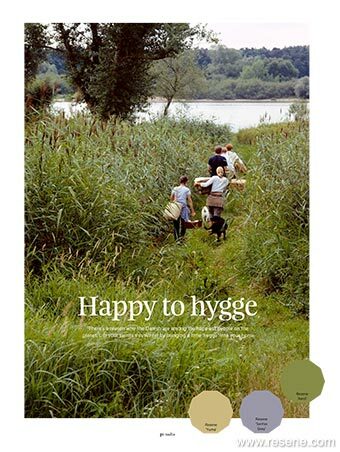 The colours are still soft but where there might have been just pale grey and cool white, there are now a range of soft muddied pastels. Weathered, aged surfaces echo of times gone by and feed our souls with nostalgia. Possessions are restricted to only those we love, which are purposeful and which are beautiful as we shift our clutter online and into the cloud. 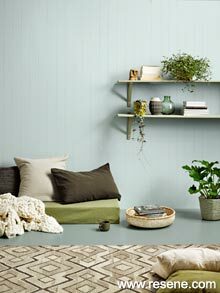 Try these paint colours: Resene Duck Egg Blue, Resene Soothe and Resene Inside Back. Let colour be the cue for space definition. As we seek a life of multiple purpose, our spaces and possessions need to do the same. A living space includes a study, a dining area and a reading nook. 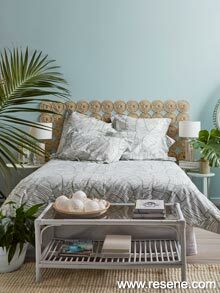 A bedroom morphs into living or study. Or becomes a retreat in which to watch streamed media. 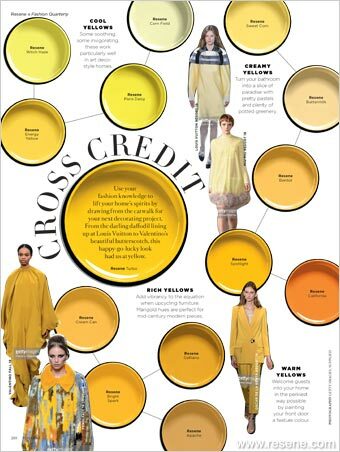 Colour defines space in new ways. 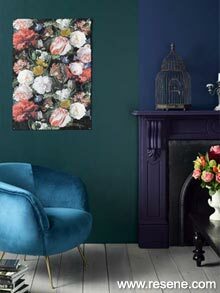 It visually anchors a desk top or bed to the wall, makes a dining space distinctive, or defines an entry. 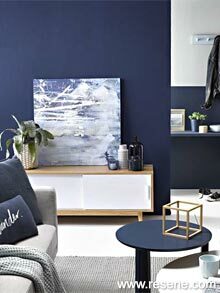 Half-painted walls, two feature walls not one, a tone change of colour… it’s all possible with paint. 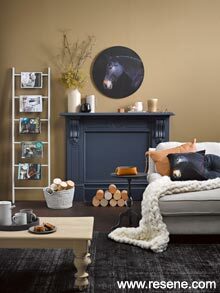 Try paint colour contrasts with Resene Zinzan and Resene Chalk Dust. 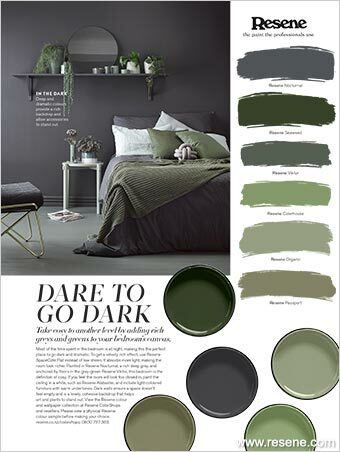 Retreat to your safe haven with dark tones. Deep light-absorbing colours offer cave-like cocoons to hide in when the world gets too scary. 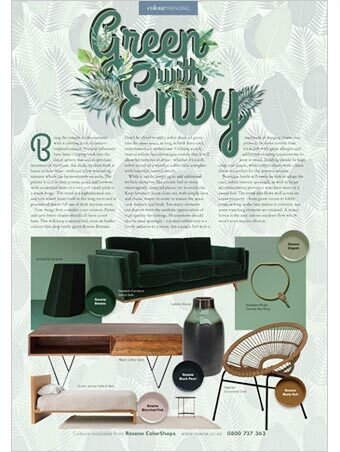 Creating places of introspection and security, these deep charcoals, moody blues and dense greens ground us but also inject a sense of daring at using such bold tones. It’s safe but not predictable. 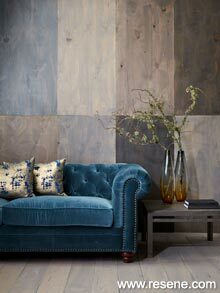 These colours are soulful and intimate yet bring a hint of drama. 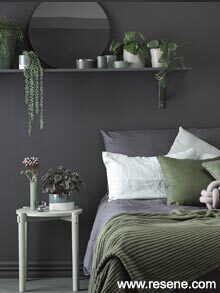 Try deep grey, blue and black paint colours, such as Resene Nocturnal, Resene Dark Side and Resene Nero. Travel the world… at home. Seeking cultural connection and a change in routine from the hum-drum of everyday life, this look is all about escapism. Even if we can’t physically roam, our minds certainly can, gathering up the casual vibes of far-flung places as we dream of adventure. 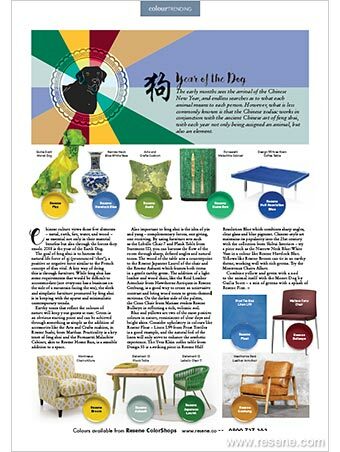 Cultural touch points and nomadic sensibilities are reflected in ethnic prints, artisan crafts, tropical motifs and indigenous art as well as spicy colours, spring greens, plummy browns and sea blues. It’s off-beat and bohemian, certainly not matchy matchy. 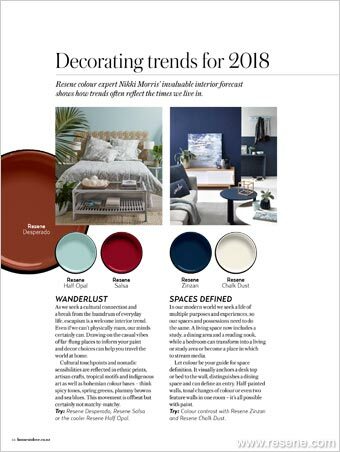 Try these paint colours: Resene Desperado, Resene Salsa or cooler Resene Half Opal. Indulge in rich gem-like shades. Face the world with confidence and energy by indulging in bold, rich tones. Inspired by gem stones and borrowing their glamorous appeal, there is amethyst, sapphire, emerald, ruby and more. 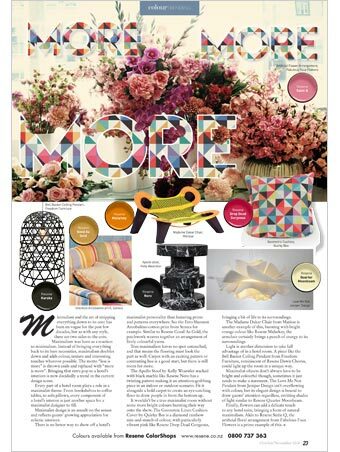 Pair them with burnished metals for an edgy luxe glamour, or less-than-perfect antiques for a shabby chic vibe. 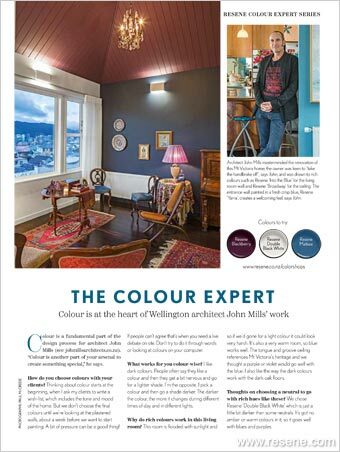 These saturated colours echo with heritage and tradition to help us make sense of an increasingly digital world. 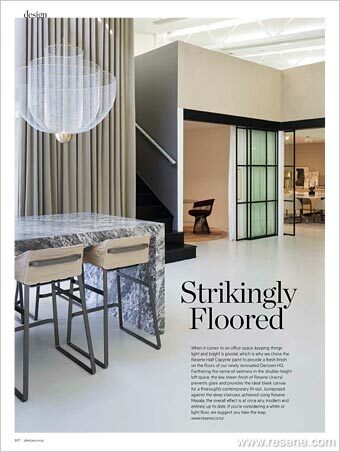 Embellishment is on the way back, as a rebellion to overly earnest, monkish interiors. 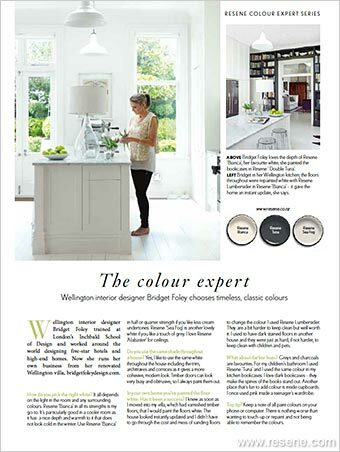 Try jewel inspired paint colours such as Resene Atlas and Resene Sumptuous. 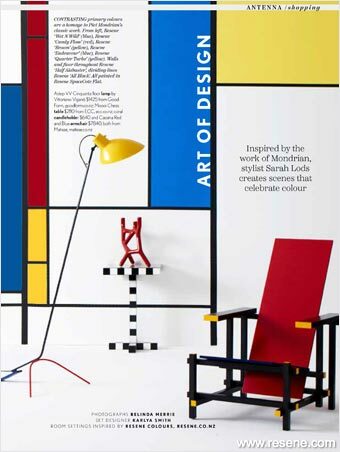 Discover your creative side; personalise your interiors. 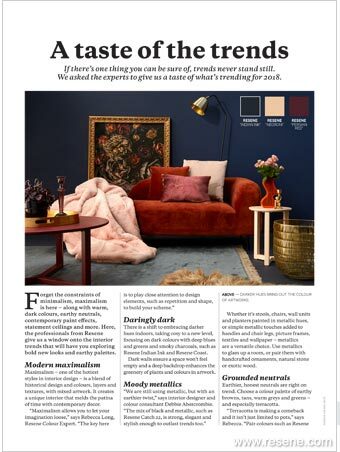 Now we can turn decorating into a personal journey of self-expression – painting a pattern on a wall, upcycling old furniture, painting pots, knitting a throw, crafting a cushion. We’re rediscovering our creative sides. 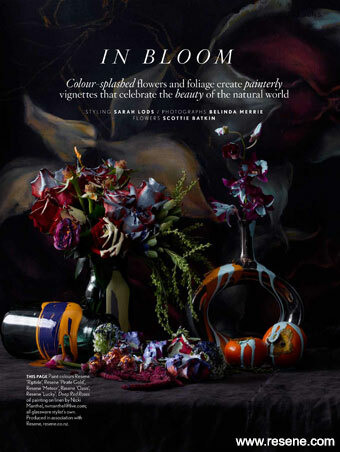 The pace of change and bombardment of trends has helped (not hindered) this flowering of individual expression. The confusion of ideas makes us stop and think about what we really want and love. Paint effects are coming back, but using more freehand and relaxed techniques. 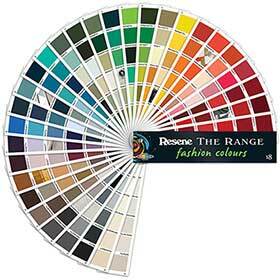 Try combining your favourite Resene testpot colour with Resene Paint Effects Medium and a little imagination. Ground yourself in this hurly burly world. 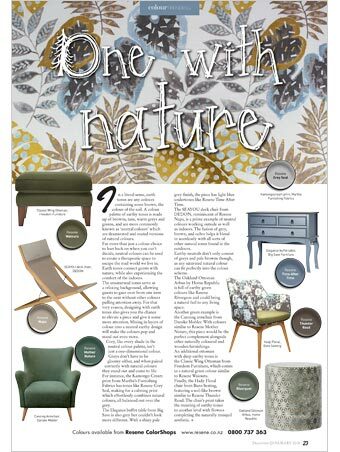 As we look for authenticity in a world where we feel pressured into quickly casting off one trend in favour of another, we are choosing to wrap ourselves in grounded tones, soothing textural finishes and earthy greens. 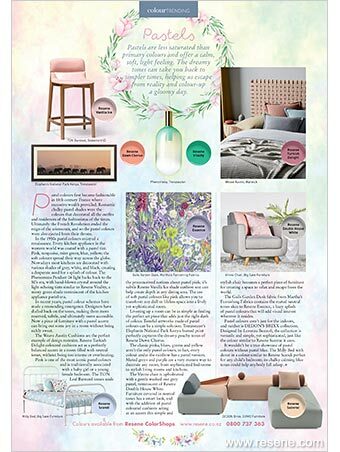 We are creating simplified interiors with a more rustic, homely feel. They feel honest and true. 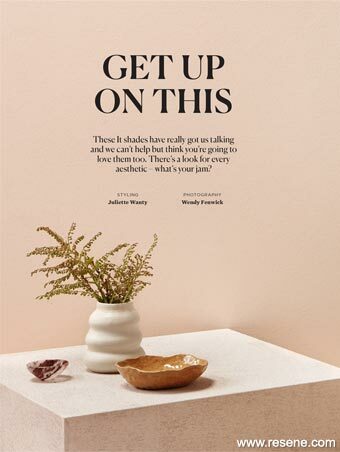 Deep golds, rusty browns and soothing terracotta, are layered up with texture, timber, plants and artisan products. 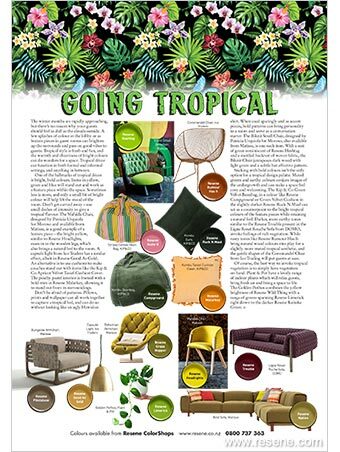 Tactile fabrics like chunky handmade knits, woven lampshades, baskets and knobbly rugs soothe us while we take the journey back to nature. 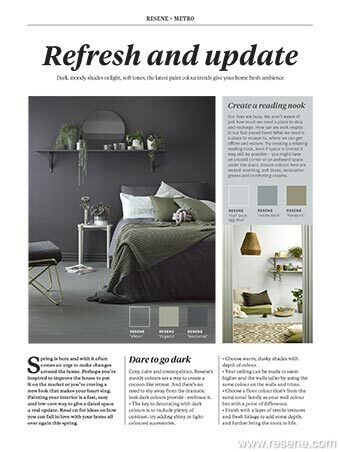 Try these paint colours: Resene Good As Gold, Resene Thistle or Resene Clay Creek. Or enhance timber with wood stains in Resene Natural or Resene Pitch Black. The need for versatility in a shared world. Not all tastes are created equal. Not everyone likes the same style but in an increasingly shared world, we need to find common ground. 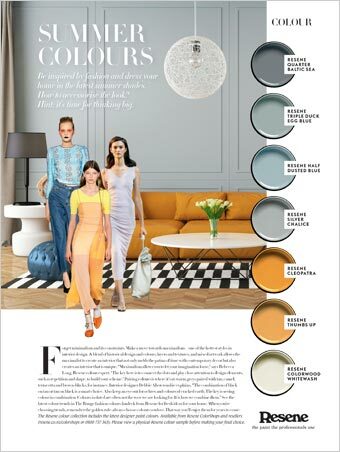 The easiness and versatility of neutral colours is the answer. 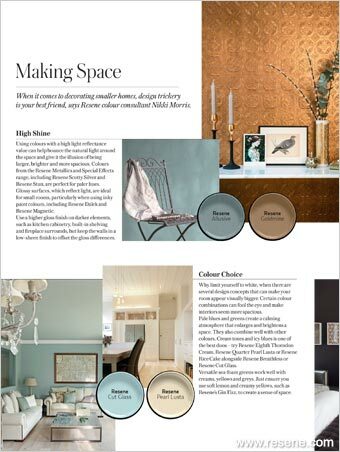 Let each member of the household add their own touches against a neutral and forgiving palette. It’s freedom for all. 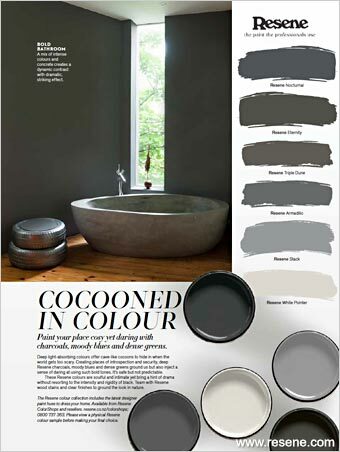 Try these neutral paint colours: Resene Alabaster, Resene Black White and Resene Truffle. Juiced up interiors with shots of citrus. Rejuvenating and invigorating, the colours of the fruit bowl are being splashed around our homes. 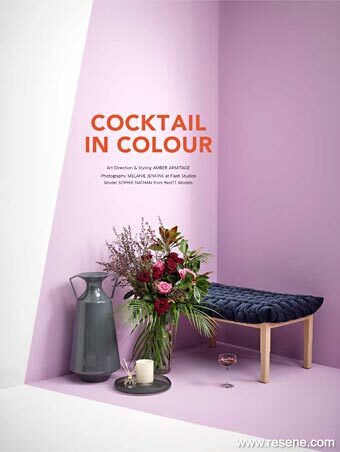 These strong tones also tap into a trend inspired by electro digital colours – intense, high octane colours that come at us in advertising and over the wi-fi waves. While we’ll be seeing accents of lemon and ochre everywhere, we will also be flirting with fun shades of orange, tangerine and lime. 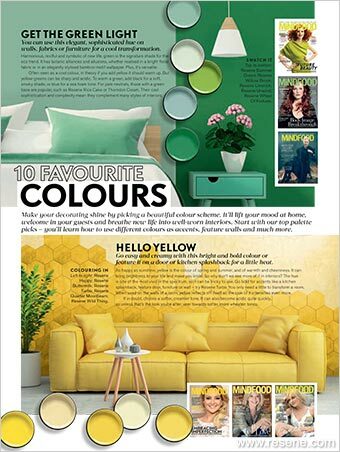 These colours have a zesty appeal that can be used in any room, from the kitchen to the kid’s bedrooms. 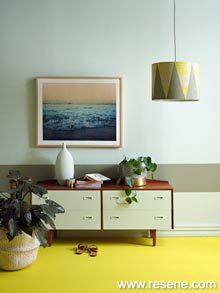 Try these citrus paint colours: Resene Turbo, Resene Daredevil and Resene Limerick. Make a statement with surprise elements. Why have what everyone else has? 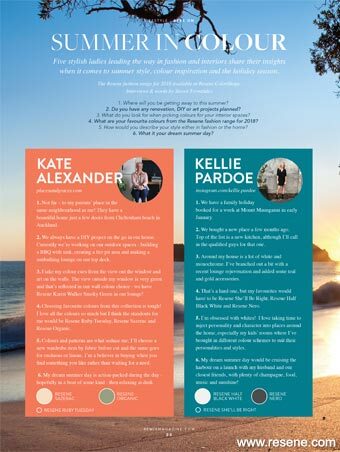 Do you yearn for a little spice in your life, a little sizzle in your scheme? Be a bit subversive. 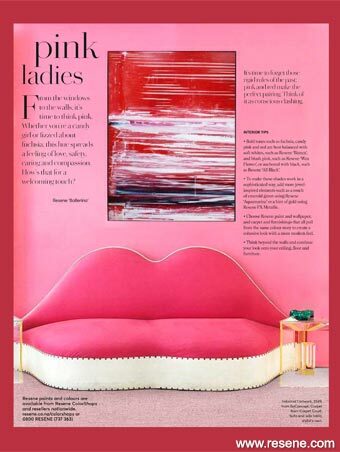 Delight and surprise yourself and your visitors with an unexpected use of colour, a splash of bright or bold here and there, or a graphic over-the-top wallpaper. Make a statement, be unique. Go on, you know you want to. 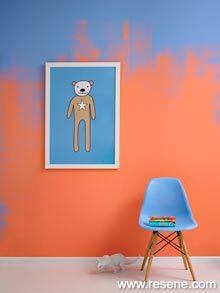 Look for complementary colours – orange with blue, green meets red – such as Resene Ruby Tuesday and Resene Point Break.